By Laura. Posted December 7, 2010 at 1:02 pm. A few days ago I was in Bath and Body Works picking up some of my beloved mini hand sanitizers. Then I stumbled upon this tubed gloss, Liplicious Crystal Candy, and I must say, I’m going to go back for a few more of the same one! I’m looooving it. Mmmm, sparkly. Click to see it larger! 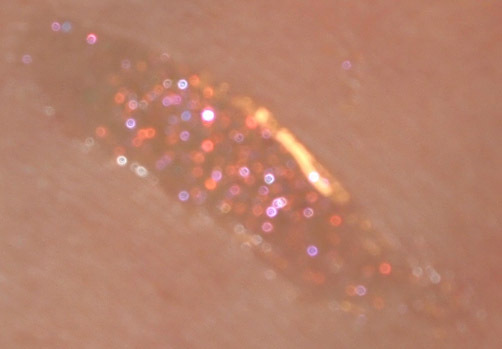 The individual sparkles in a clear base. How GORGEOUS is this? 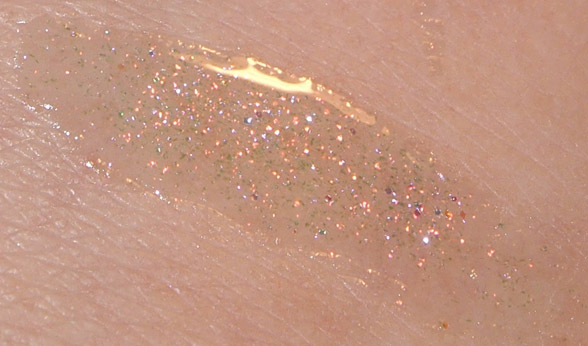 As you can see, this gloss has a clear base packed with small pink shimmer with bits of larger iridescent shimmer particles. It’s a bit tacky, but not extremely sticky, and has this AMAAAZING peppermint scent. I’m LOVING it. Limited Edition? : I’m unsure; it’s been there for a while but things randomly disappear from Bath and Body Works, so I’m going to give a tentative yes.